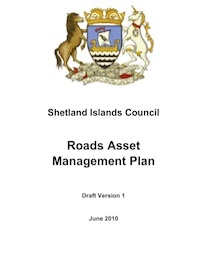 The Shetland Islands Council – Roads Asset Management Plan is available here. The Road Asset Management Plan (RAMP) reviews the Shetland Island Council’s current status of asset management practices and describes a review process that will take place to update the results of the document on a continuous cycle. Sections of the document include finance, lifecycle plans, risk management, user expectations, and future developments. The RAMP was developed by reviewing current practices and determining areas where current practice did not align with asset management principles. Customer surveys were also taken into account to determine customer priorities and consider service accordingly. This document includes the following sections: Communications and Reporting, Financial Plan, Future Demand, Introduction, Inventory and Condition, Levels of Service, Objectives and Measures, Process Improvements, Risk Management. • Includes substantive list of process, data, and/or systems improvement actions.